Looks matter these days. And cosmetic dermatologists from SAARC countries, including India, discussed the best and latest techniques, medicines and treatments that could give them the best results in that direction. 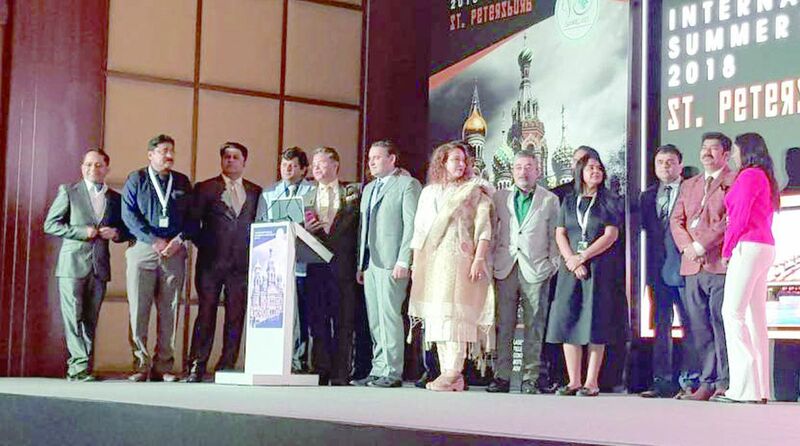 Dr Ajay Sharma, the leading dermatologist of Meerut catering to the patients of Western UP, was a member of the Indian delegation at the conference of cosmetic dermatologists, ‘The International Symposia 2018’, organised by SAARC AAD (Association of Aesthetic Dermatologists) in St Petersburg, Russia. At the four-day conference from 10 to 13 June, experts discussed latest techniques, treatments, medicines and new findings across the globe for improving the appearance of patients. Over 200 delegates addressed the symposium, mostly from SAARC countries, as also from Afghanistan, USA, UK and Europe. The demand for new techniques and treatments in the field of cosmetic dermatology is rising in developed and developing countries, said Dr Ajay Sharma, sharing his experiences shortly after his return from St Petersburg. Dr Sharma is also on the board of SAARC AAD, which is headed by the country’s well-known dermatologist, Dr Anil Ganjoo from Delhi, while its secretary is Dr Neeraj Pandey from Lucknow. SAARC AAD was formed in New Delhi in 2016 to provide cosmetic dermatologists of SAARC countries a platform to discuss latest treatments which could be beneficial to their patients. The conference was this year organised in St Petersburg to make it popular globally. Dr Sharma said conferences have been held in Dhaka, Maldives, Abu Dhabi, Dubai and Kathmandu with the purpose of spreading awareness in the field of cosmetic and aesthetic dermatology. He said India is way ahead in the field of dermatology among the SAARC countries and is trying to contribute to the field through such initiatives. The association also goes for tie-ups with other associations and holds programmes on plain dermatology as well. An international conference was also organised last year in Udaipur while another has been lined up for Vishakhapatnam in December this year. At the St Petersburg conference, renowned international experts from the USA, UK and European countries briefed the gathering of dermatologists about different ways and methods that are being adopted in their respective countries and which are giving good results to the patients. “A lot of research is being carried out in the field of cosmetic and aesthetic dermatology, ” said Dr Sharma. He delivered a lecture on body fold rejuvenation. “There are many hidden parts in the body like underarms which are generally ignored by the people. These parts which are being addressed as ‘hidden secrets’ also affect adversely the appearance of the people,” said Dr Sharma. Now people across the world and also in India are very aware of their looks and want to take care even of the hidden body parts, he added. While going to the beach or for a swim, people are specific about their arms and underarms, he said. It is the responsibility of a dermatologist to cater to their requirements, said Dr Sharma. Cosmetic dermatology includes diagnosis, treatment and prevention of skin conditions that adversely affect the looks of people. It includes a wide range of treatment of scars, sun damage, redness, hyperpigmentation, excess fat and excess unwanted hair, said Dr Sharma. “Now things are changing as compared to what it used to be two decades ago,” said Dr Sharma, adding that earlier they had to bank on the data of western countries but now they have their own figures of research. This is significant as skin types are different in Asian countries compared to western countries where people are fair. India is a big market now for western companies. About 15-20 years before the companies used to call one or two people and train them but now with globalisation, things have changed. Since the Indian subcontinent has a big market for these companies the training is now given right here which makes a lot of difference, he averred. Also with changing times men like women are becoming more particular about their looks. “Men go more for hair treatments, hair transplants, body laser, etc.,” said the doctor, asserting that cosmetic dermatology has become important for one and all and gender barriers have been broken. A man wants to look as attractive as a woman.